Update: So rather than make you read through this long drawn out mess, we decided to post a summary to get you up to speed since a number of folks are still coming to this specific post. This afternoon, a reader of ours noticed that the Android Developer pages were updated to show that they no longer support CDMA devices. Without any word from Google on these changes, we started asking important questions and posted this story since that affects the LTE Galaxy Nexus, XOOM LTE and Nexus S 4G. Could this change the way updates are issued? What about factory images? What does it mean to no longer be “supported?” All questions that we feel we deserved answers to. Once enough of a stir was caused, a statement was issued by an Android engineer. Basically where we stand now, is that according to Google’s standards for AOSP, CDMA devices cannot be officially “supported.” It’s an odd situation and one that even some of our readers who create their own AOSP ROMs are having a hard time wrapping their brains around. Thankfully Google has assured us that the LTE Galaxy Nexus and all other “Nexus” devices will still receive timely updates, remain unlocked, etc. Wow, so I’m not really sure where to start with this head-scratch-worthy news. 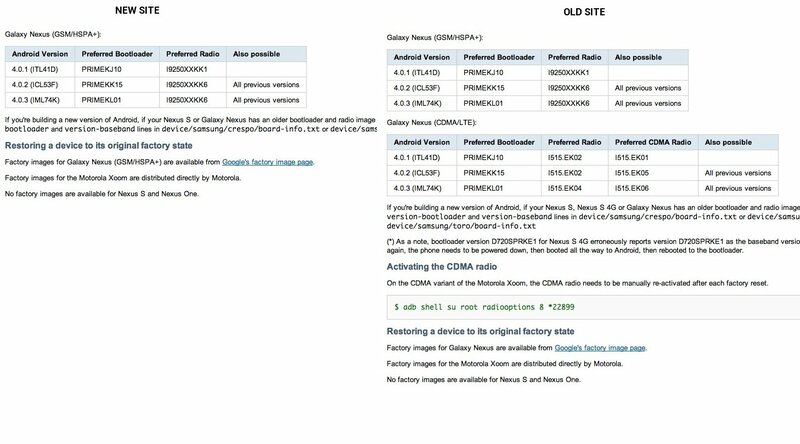 Thanks to a reader, we have now realized that the LTE/CDMA version of the Galaxy Nexus that thousands of you purchased, may no longer be considered a “supported” developer device by Google. You will notice in the screenshot above that the device “toro” – which was the codename for the device – has been removed from the list of supported devices. There is also a note above that which reads “No CDMA devices are supported.” Not sure it could be any clearer than that. Update: As some have pointed out, the “crespo4g” has also been removed which is the Nexus S 4G with Sprint (another CDMA device). Update 2: “stingray” is also gone – that would be the LTE/CDMA Motorola XOOM. But to make matters even more interesting, we dug a little deeper into a cached page from January 28 that clearly shows “toro” as still being a part of their plans. It also included special CDMA radio instructions for developers which have now been removed. Picture below. Why would this happen and what exactly does it mean? Only the Android team, Google and Verizon (probably just those two since it’s all CDMA devices) know for sure. Could it have anything to do with the Google Wallet situation? We know that the app was updated and made available to basically all Nexus devices within the last couple of days, but not the Verizon version. Maybe there was a breakdown in negotiations which took the phone out of their “Nexus” title requirements. Seems doubtful. Then what could it be? I think one thing we all want to know is how this impacts updates in the future. One of the main reasons we purchased this phone was to be at the front of the line when it came to new OS deliveries. Will this impact that? Will we still see factory images after major releases? What else changes? Would love some further explanation from not only devs, but maybe even the Android team on how this status impacts CDMA phones going forward. Why would CDMA not be supported at all? Because it’s a dying technology and its reach is limited? GSM is clearly a more global option. Update 3: As our friends at Phandroid have pointed out, this could be Google’s way of streamlining their “supported” devices. GSM is a more widely adopted option across the global, so limiting their official support to those phones probably makes more sense. This more than likely has nothing to do with updates or anything that should completely ruin your day. Update 4: Google has issued a statement. It definitely has to do with CDMA tech and its conflicts with AOSP code. Hopefully we will have some answers soon. Try to stay calm, for now.